I had just finished watching the exhilarating tennis match between Rafael Nadal and Novak Djokovic at Roland Garros when our postman brought news from France. A non-philatelic friend of ours who lives in the Morvan always sends me any stamp clippings she can find. 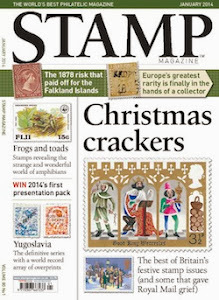 Isn’t it amazing that in the heart of rural France, in a local weekly, which basically only concerns itself with produce at the neighbours’ farm and who’s dating who, there is a page full of philatelic news every three months? 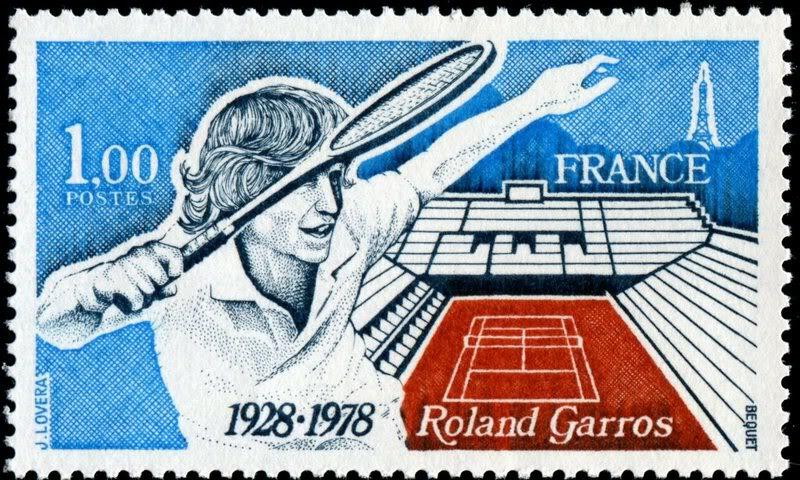 And this time it advertised the issue of a new stamp in September, commemorating Roland Garros. Some coincidence! Now, I love Roland Garros and regard it as by far the finest of the four Grand Slams, but that’s probably because it is the only one I’ve ever actually been to. That was back in the 1990s, when I could enjoy seeing the likes of Arantxa Sanchez-Vicario and Mary Pierce play. Unbeknown to us, it happened to be the tournament at the end of which French hero Henri Leconte said goodbye to his career. Climbing up the umpire’s chair after he had played his final match he said goodbye to his fans, and we were there to witness it! We also saw Steffi Graf doing a signing session, but as it was in an enclosed part, and seemed to be for school kids only, we didn’t dare join the queue. But every time Steffi crosses my mind, I think of the above stamp, even though it isn't really her being depicted. It's not even meant to be anyone really, just a generic tennis player. And what's more, I think it’s a more of a him than a her anyway. This year, Roland Garros was dominated by the return of previously injured Nadal and the upcoming Frenchman Tsonga. Everybody thought this might be his year, but it was not to be. Sounds familiar? Our own Andy Murray could not even be there this year, what with him suffering from back injury. But anyway, back to the 2013 Roland Garros stamp. 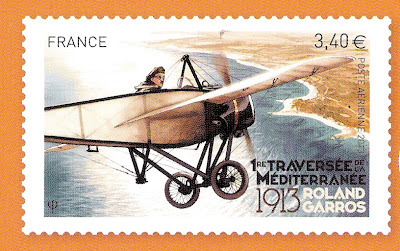 It has nothing to do with stamps, as you can see, but with aviation. 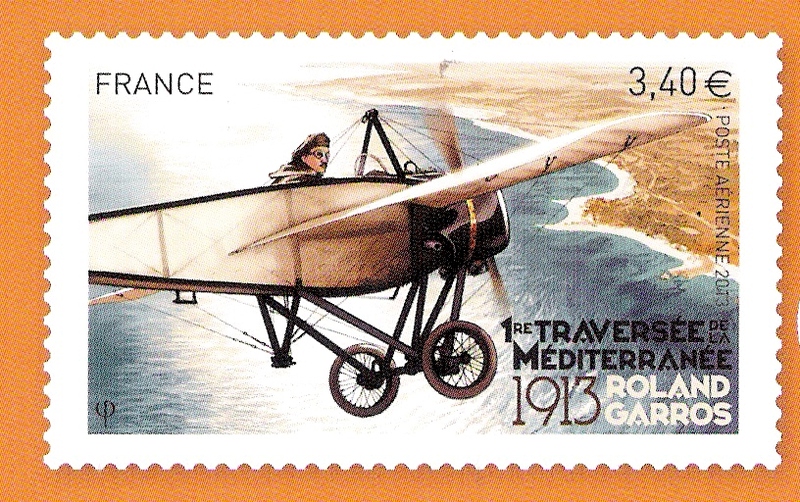 Roland Garros’ claim to fame is that he was the first pilot to fly non-stop over the Mediterranean Sea, from the south of France to Tunisia. 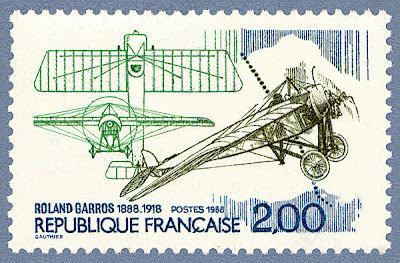 He did this in 1913 and the centenary of this feat is commemorated later this year with a special airmail stamp. So what did Garros have to do with the tennis tournament? Well, he was an avid tennis player in the time when France was enjoying the success of the ‘Four Musketeers’, a quartet of rather successful French tennis players. To defend their Davis Cup title on home ground, in 1928, France wanted a proper showcase stadium. The tennis centre in Paris where Garros had always played offered its land to France as a possible site for this new stadium. The only proviso attached to the sale was that the new stadium had to be named after the centre’s most famous member: Roland Garros! 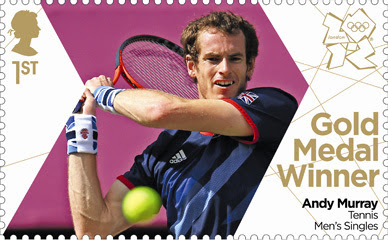 With Andy Murray winning Wimbledon would there be a chance for another stamp featuring this great player (just like Royal Mail did with earlier successes like the Worldlcup Rugby in 03 and the Ashes in 05)?